The beer pours a nice, paler yellow with orange and gold hints. The beer forms a beautiful head of creamy, medium-sized bubbles that settles to a half-finger’s width and leaves a fat fluffy drizzle of lacing on the glass. 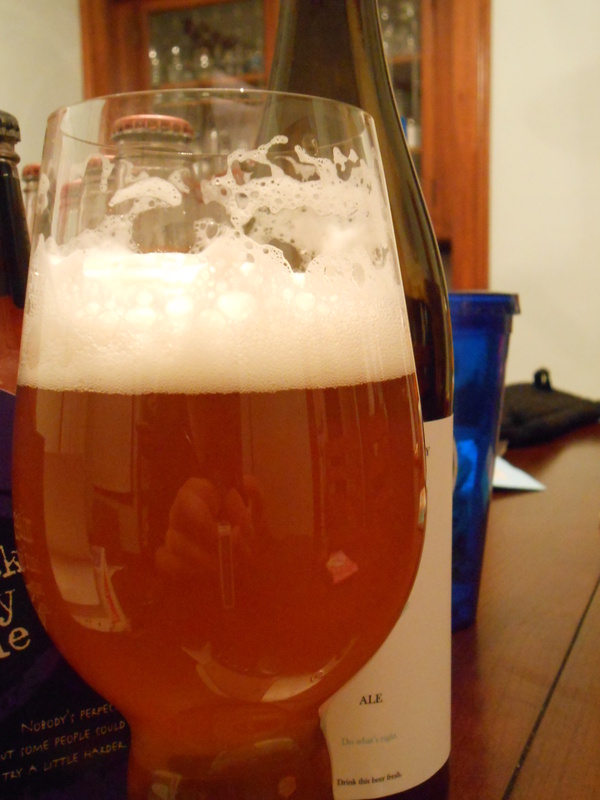 In body, the beer is clean but cloudy and nearly opaque. On the nose, the beer smells wonderfully hoppy. Grass, pineapple, apricots, and even a ghost of peach work their way across the nose. Pine prickles at the back of the nostrils as well buts melds really nicely with the fresh-cut grass smell. Little to none of the malt can be sensed, as this beer is really here to showcase the El Dorado hop, but as it warms I do start to sense a creamy-bread scent on the edges of the nose. On the tongue, the beer tastes far more balanced than the nose would have you believe. Healthy, shivering bitterness blends with bready sweet malts and only comes out healthily bitter, but not overpowering. The beer finishes wonderfully dry with just a touch of acidity along the edges of the tongue. In flavor, the beer tastes of grass, unripe pineapple, apricots, and just a touch of wheat crackers and bread. The malt and bread build towards the finish, though the flavor is surprisingly dry. The finish is fresh cut grass and pineapple juice. In the mouth, the beer feels crisp and tingly, with a body on the light side of medium and a mild carbonation that does provide a nice prickle, but also comes off nicely fluffy. After the beer leaves, the mouth is left sticky dry with lots of saliva in the cheeks. Overall, this is a nice drinking hoppy pale ale. What makes this a pale ale and not an IPA is really semantics in my opinion. It is a beautiful hoppy beer that really showcases the El Dorado hop, and it also has some great malty balance that gives those hops a perfectly light stage to work upon. Another fresh, hoppy, crisp beer from MBC. Superb beer, superb taste, superb company concept (giving back, etc…) I just wish the prices were a little lower. MBC’s pale ales would go great in six-packs, but none of us could ever afford it. I know the cost is going to good causes, but I really wish they could step back on their pricing… 7.00 for a pint of 5.5% beer is a bit much.